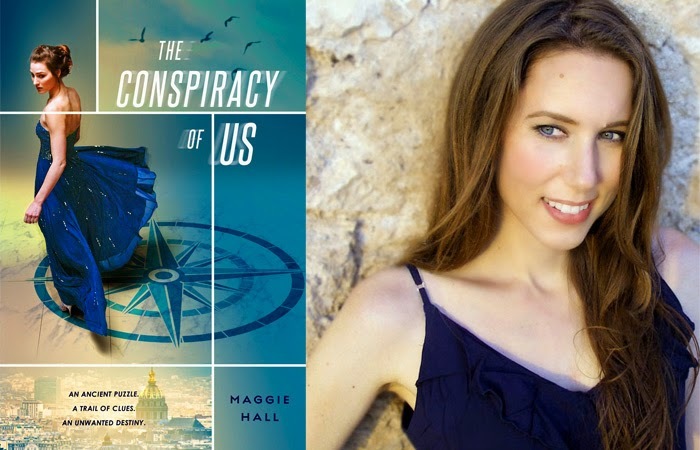 Maggie Hall's recent debut YA novel The Conspiracy of Us follows a strong female heroine that travels the world to find her real family and the truth behind her purpose in her society. Avery West doesn't know what to expect when handsome Jack Bishop asks her as a date to prom. She certainly doesn't expect there to be ancient prophecies and assassins sent out to kill her involved! So if you guys didn't know, I recently read and had a crazy obsession over Maggie Hall's book! I'm crazy in love with the main characters and the world that the author has so greatly pulled together. If you want to read all about it in my non-spoilery review, check it out here! A while back, I asked author Maggie Hall a very serious question. I was supposed to post the question with my review, but I could not wait for the book to come out to post it! As you can see, I already posted my review and now I'm back with a questionnaire! In your book Avery West has only ever wanted to know more about her father and her relatives. She's only ever wanted family. Family is a foreign term in the eyes of your main protagonist. The main protagonist also abandons her mom to go to France and discover the hidden secrets of her family. In Avery's situation, would you have done the same thing, or would you leave the secrets the way they are- undiscovered, just as they should be because some secrets are better left hidden away? What an interesting question! I am far too curious to let any secrets stay undiscovered, and if I learned something of that magnitude, I would absolutely have to know what was going on. But I think (certainly now, as an adult, and probably even as a teen) I probably would have been more careful about it than Avery. I'm adventurous but also pretty cautious, and I probably would have tried to discover the truth in a different way. My upbringing was very different from Avery's, though: I've always felt loved by my family, and don't have that empty, lonely feeling that pushes Avery to do what she does. When Avery finds out she has family she didn't know about, not only is this a welcome shock to her, but she realizes that her mom- the one person she thought loved her and who she could trust unconditionally- has been lying to her about something really important her whole life. She's angry and heartbroken and intensely curious, and so is more impulsive than I think I would have been in that situation- but I certainly agree with her desire to know where she came from! Awesome! I'm moving this up on the list of books I want to read in 2015. Looks like an entertaining read! Yay! Can't wait to read your thoughts on it! This was an interesting question! It is fun to see the authors perspective! I thought this was a pretty fun book, I am excited to see how it continues! yay someone who read it and understands how much I need the second book! How interesting! I've been so excited for this book, and now the curiosity has grown even more - I need to read it soon!